Pilgrims Progress Part Two - Westminster Congregational Church ""
This downloadable copy of Pilgrim's Progress part II is a unique formate--a wide margin looseleafe edition. The footnotes are taken from a rare 1821 edition that hosts comments from John Newton, author of Amazing Grace and others. 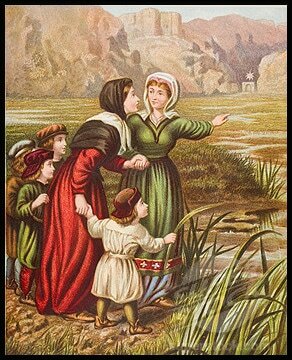 The entire book of Bunyan's Pilgrim's Progress part II can be downloaded from this site chapter by chapter and made available to class members. Teachers should encourage discussion of the materials and note taking---adding pages of student notes, thoughts and observations will prove invaluable. Don't rush! Proceed with much thought and prayer. Manual Chapters for looseleaf binders. Offer's notes and commentary.